Lost, 1 shank and 3 lures, 10/24/14. Please return if caught. Not to long ago I wrote about having one of those nights that we all dream about. Conditions were perfect and everything went according to plan. Well Friday Oct. 24th was not one of those nights. Conditions were ideal but no fish and I lost an entire rig along with about 150 feet of wire. My friend Richard and I made plans to fish out of his boat that night since mine is still in need of repair. We started around 6:30 pm and for the next 3 hours the only thing we caught was a 12 inch Smallmouth bass that I managed to snag in the top of his head. Around 9:30 I got hung up. Once Richard got his line sin we started to motor up to the snag but the wire slipped from my hand, got wrapped up in the reel and it snapped. 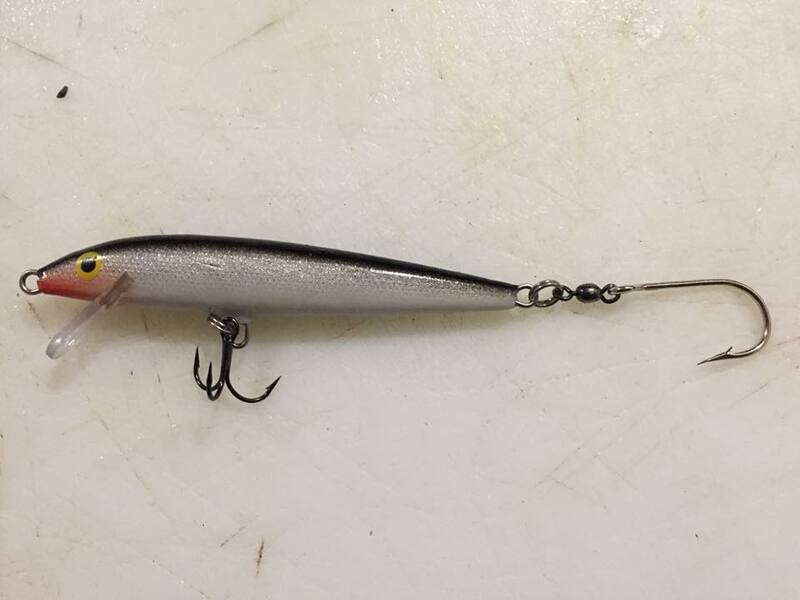 150 feet of wire, a 1 1/4 pound weight, shank, leaders and 3 Rapala’s lost with one of them being my last #9 Bleeding Olive Flash pattern. I felt like Charlie Brown as Lucy pulls the football away for the upteenth time. The water is still clear and there were hardly any floating weeds. Surface temps were around 53 degrees. It shouldn’t be much longer and the bigger fish should be moving in. We fished from the Blue Boat house up to the Edison Discharge. Good luck to anyone that can make it out. I have a feeling we are going to get a cold snap and the fall fishing will be over before it ever gets started. December is a time that most people spend scrambling around getting ready for Christmas. Shopping for presents, Christmas parties, visiting relatives and everything else that goes along with the holidays. As for me I’m watching the weather to see if I can get that last trip in for the year. Every year is hit or miss, last year it was a miss, this year was a different story. Earlier in the week the weather forecasters were calling for 50+ degree days for the weekend. That sounded great but with a warm front usually comes a lot of SW wind. Well Saturday came, no rain, no wind and warm temps. Time to launch the boat. Originally I had planned on going alone but I talked to my friend Chris earlier in the day and since he didn’t have anything else going on he decided to come along. We hit the water at about 3:30 pm and headed downstream to my usual spot. Surface temps were 39 degrees with about 2 feet of visibility. Not exactly the crystal clear water I had been hearing from some people. If I had known it was going to be like this I would have started earlier. Never the less we set up and started fishing. I was running Rapala’s in size 11 down to 7 and Chris was running a pair of Smitwick Rattlin’ Rogue’s. There were very few surface weeds but again there were plenty below the surface. We weren’t constantly checking lines but we could tell they were down there. Not much happened in the first hour. About the only excitement we had was watching a pair of Bald Eagle’s fly around us and roost in the trees along the Solutia property. Around 5:30 I finally had a hit on my kicker and a #7 Bleeding Original Shad. While I was bringing her in Chris got hung up and his shank busted above the lures. He lost the whole rig but after a few minutes I got him set up again and we were back to fishing. 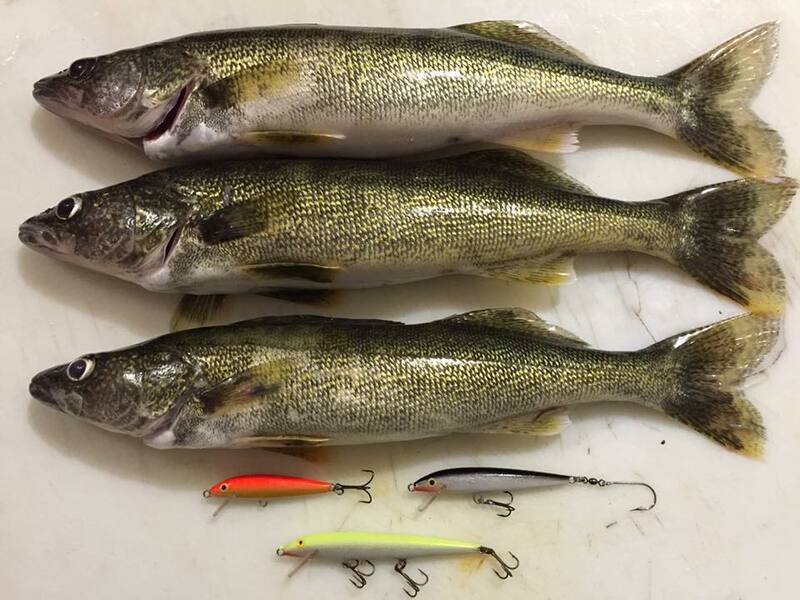 During this time I swapped out my two bigger lures for a #11 GFR and a #9 Downriver Steel custom Rapala. We fished for about another 30 minutes when Chris told me his hand was starting to get sore and cramp up. Things were slow so we pulled lines and headed in. 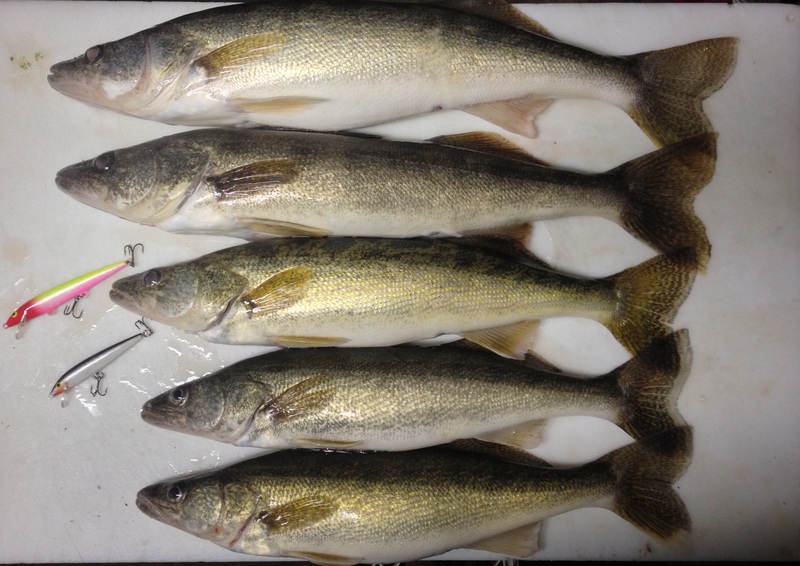 We only got the one fish but I was able to keep my streak alive of 11 straight months of catching a walleye in the river pulling wire. If we get another warm spell I will try again. It is kind of nice being out there fishing at night when the homes along Grosse Isle have their houses all lit up with Christmas lights. It would be nice to get out again but at the same time I am hoping for a lot of snow this winter. The water levels are way down and it is only going to get worse unless we get a lot of snow. From what I have been hearing that even if we get a record snowfall this winter it still won’t be enough to get the river back up to pre-drought levels.